This page contains links to third party plugins for Rhythmbox. If you have your own, or know of any others, please add them here. For information on plugins included with Rhythmbox, look at plugins. If you are interested in writing your own plugins, please look at the plugin writing guide to get started. Before adding a link to your plugin here, please ensure that the plugin information file (*.rb-plugin or *.plugin) contains valid contact information - at least your name and email address. This allows users to give you feedback and help you improve your plugin. Please only link to full self-contained plugins here. If you have a modification to one of the plugins included in Rhythmbox, please file a bug in the issue tracker and create a merge request. If you have a modification to one of the plugins listed here, it's better to send your changes to the author of the plugin. Links to plugins without sufficient contact information and to things that aren't plugins will be removed. 10 band equalizer for Rhythmbox. Searches the web for the album art of the currently playing song using Google image search APIs. From the resulting images, one can then choose an image to set as album art. Replace the Rhythmbox large toolbar with a Client-Side Decorated or Compact Toolbar which can be hidden. Allows to stream music directly from an instance of an Ampache music streaming server. It allows to remote control Rhythmbox with Banshee remote Android application. Rhythmbox plugin for accessing a Beets music library using its web API. Very simple plugin that hides the rhythmbox window instead of exiting it once the quit button is clicked by the user. However, it does not create any additional icon in the systray that messes up the theme and look. Instead, rhythmbox nicely blends into environments like Cinnamon (beware that if your desktop environment does not provide the way to interact with your music player via MPRIS, you will not be able to put rhythmbox back into foreground once you have closed it). 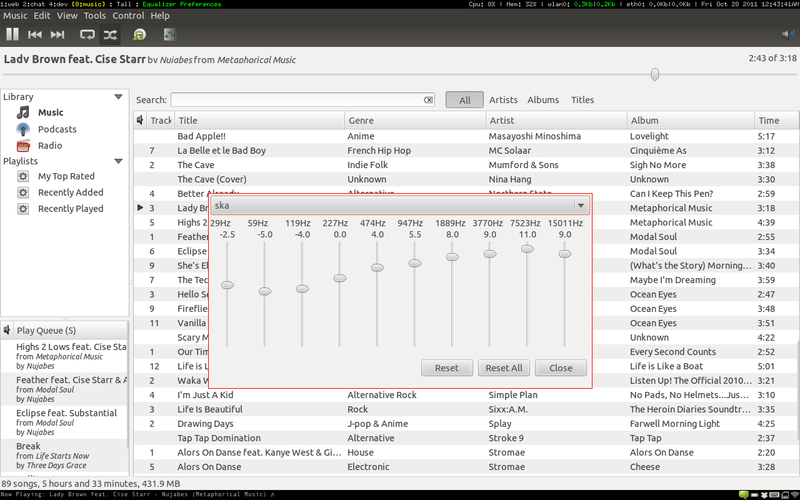 Rhythmbox plugin for Ubuntu to really close the application when the close button (x) is clicked. This brings back the true Gnome Rhythmbox experience. Create playlists from your music collection using keywords for a defined duration. Browse your music collection by the Cover-art of all albums. Covers are displayed as icons and you can play, queue and search for new covers. Drop in replacement for the default ArtSearch Plugin. Allows you to control where to get your coverart, provides new internet coverart options and has many bug-fixes not included in the default ArtSearch plugin. This plugin shows album cover art for the current playing song in Rhythmbox on the desktop. Control rhythmbox from the shown album art. DRC for Rhythmbox delivers the complete functionality to measure a room response, create a correction filter and apply it to music playback to do real digital room correction. Organise your music library. Fileorganizer will move and rename files according to your tags and then update the database so you don't lose your ratings and play counts. It will also back up duplicates and move files like album art with your files. Allows you to enter a full screen mode with album art, simple play list functionality and a very smooth, simplistic dark-themed look. Adds a context menu entry and a toolbar button to jump to the playing song. 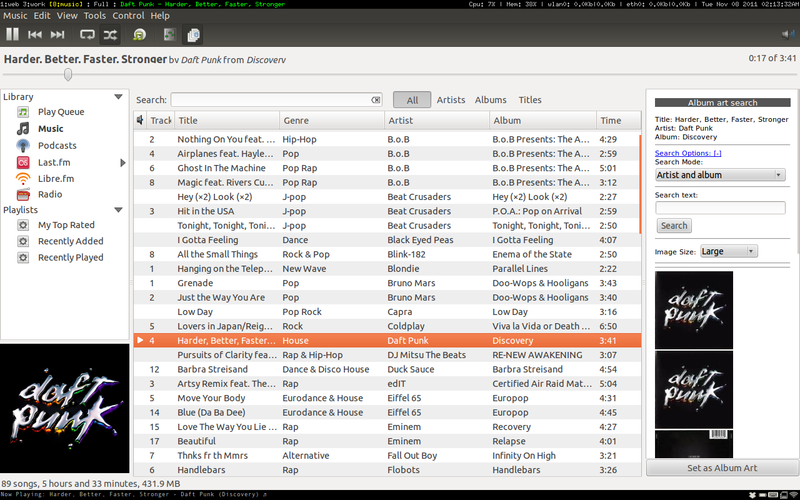 It's very similar to the 'Jump to File' feature in Winamp, including the ability to enqueue a song. Add some LastFM related functionality to Rhythmbox: love/ban buttons, playcount sync and loved tracks sync. NEW feature! ~ Track Fingerprinting: Match your tracks against LastFM database and retrieve it's info. Port of the 0.x plugin with the same name. Chooses the next song to queue based on the currently played track. Makes use of Last.fm recommendations. Loop part of the song. Displays lyrics for the current playing song in the right sidebar. Adds an option to open the folder containing the selected track(s) to the right click context menu. Parametric equalizer for Rhythmbox with support for up to 64 free configurable Bands. PlayLast.fm is a rhythmbox plugin allowing to create playlists from Last.fm scrobbles. This plugin performs batch import/export of playlists from/to a selected folder. Export first because importing deletes all static playlists. This functionality is particularly useful for backup and synchronization to other machines. Adds podcasts to Play Queue in release date order and remembers their playback position. This plugin for Rhythmbox queues a random album and plays it immediately. Adds rating filters to the library browser, allowing you to filter favourite or unrated tracks. Adjust the pitch, tempo, or speed of the currently playing track. As of December 18, 2011, rbpitch is in beta status for Rhythmbox 3.x, and stable status for Rhythmbox 0.13.x. A mobile web interface, which allows you to control Rhythmbox from a mobile or any other modern webbrowser. Icon in system tray for Rhythmbox - forward, next, play, pause, quit, volume control, minimize to tray, closing prevention, quick add an album or artist of the current song to the queue. Allows you to send any song in your library or play queue at the beginning of the play queue. Stops playback after current track. Find and display the guitar tablature (also for drum and bass when available) of the current playing song from tab websites. The tablatures will be showed in a small panel integrated in the Rhythmbox GUI. Control Rhythmbox from the system tray - rate songs, forward, next, play, pause, quit and volume control. Search a song on YouTube, look for its lyrics or find its album and/or artist on Wikipedia, AllMusic, RateYourMusic, DiscoGS, AllAboutJazz, Last.fm, Grooveshark, MySpace, Facebook, Amazon and Torrentz, with just one click! This plugins adds a fully customizable 'Web' menu to the menu bar and to the context menu, along with new keyboard shortcuts. You can also add your favorite websites and remove those that aren't helpful. Search for selected artist, album, track or genre at the click of a button. Search videos for selected artist, album or track. This plugin gives Alarm Clock functionality to Rhythmbox. Tell Rhythmbox to start playing at a certain time. Change Rhythmbox volume according to focused application. Configure a list of prefixes to ignore in artist names when sorting the artist list. This plugin looks at artist names and automatically adds a sortname entry for tracks that match the prefix to ignore. 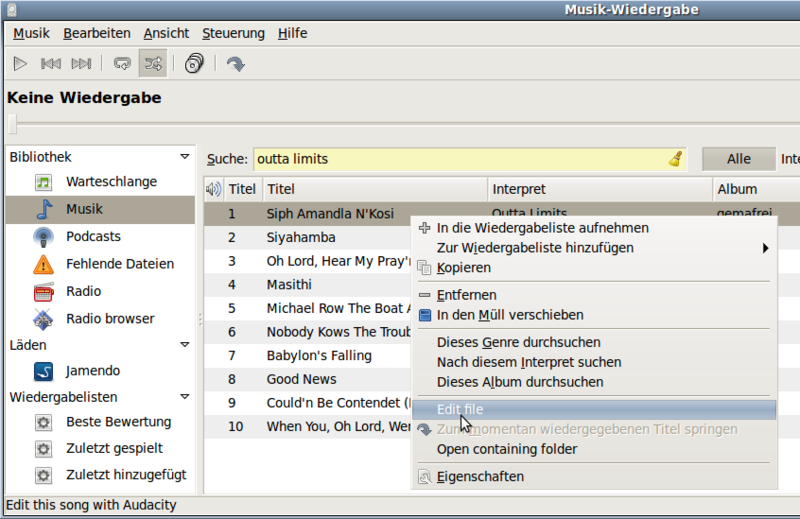 Allows Rhythmbox to, for example, sort "The Beatles" under "Beatles" instead of "The". 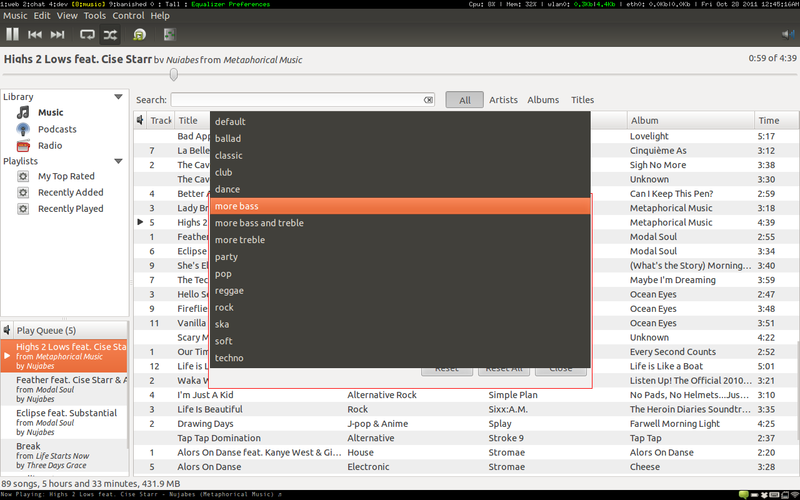 Copies the files of the selected songs to the Gnome Clipboard. Provides a delay at the start of a song and a metronome style count down. Perfect for playing along to a song. Creates a playlist of specified length given any number of keywords; generally accurate within 20 seconds. Make Rhythmbox aware of certain D-Bus events and react upon them. This plugin shows album cover art for the current playing song in Rhythmbox on the desktop. Provides a source for duplicate files. The search is based on the tags. Edit current file with Audacity via context menu. Adds items to tray icon menu to provide fast access to the current playing track and its position. This can be very useful when long media files are playing. Browse the music in Rhythmbox by folders. Plugin that shows the radio station lists of icecast (dir.xiph.org) and shoutcast directly in rhythmbox. So the user can easily search for internet radio stations in rhythmbox and play them. Recording of radio stations is also supported. This plugin will display the View : Jump to Playing Song link as a button in the toolbar and as link in the Browser’s context menu. Hides toolbar button (including Browse) when in small display mode. This plugin displays recommendations related to the current track you are listening. Chooses the next song to queue based on the currently played track. Makes use of Last.fm recommendations. Displays the song name and artist name on an LCD display managed by LCDproc. Updated and extended version of original plugin (original Homepage). Copies current song information to your system clipboard on song change. Automatically generates an XML document containing the current song information. Just relax while earphone got unpluged by accident. Right-click on an album to play its all tracks. Add selected song to your play queue by pressing middle click on your mouse. Adds an entry in the status icon popup menu to move the currently playing track to the trash. Rip internet radio streams to your harddisk using streamripper. This plugin also supports automatic recordings at a given time. Remotely control Rhythmbox with your cell phone. Remuco can be used with Bluetooth or WiFi and JavaME equipped mobile devices . Resume playing the last song after Rhythmbox start. A light GWT remote interface to Rhythmbox, optimized for smartphones. Based on the Rhythmweb plugin from Michael Gratton. A telnet interface to rhythmbox which lets you control rhythmbox from a terminal. Show to your Pidgin buddies what song you are listening to with Rhythmbox. Pidgin's status message can be customized with song's title, artist, and album. Lets you control Rhythmbox remotely, from your web browser or android phone via an app. It is not an Internet radio server - it does not play music in your web browser, rather it lets you control Rhythmbox on a machine or android phone other than the one it is running on. Useful for deleting unwanted music from the library and harddisk. No need to go through new music and filter the things you like. Just delete the ugly stuff when you encounter it the first time using Ctrl+Sift+Del. Plugin for copying music files of a playlist into a different destination.